SICK OF READING CLICKBAIT CONTENT THAT FAILS TO MOVE YOU? US TOO. Our literary journal is not strictly about the Faith. Although some pieces explicitly concern Catholic tenets, many do not. All pieces are created flowing from the writers’ identity in Christ. Our literary journal, complete at 68 pages, features creative nonfiction, flash fiction, and poetry that will nourish your soul, engage your mind and draw you to true wonder. 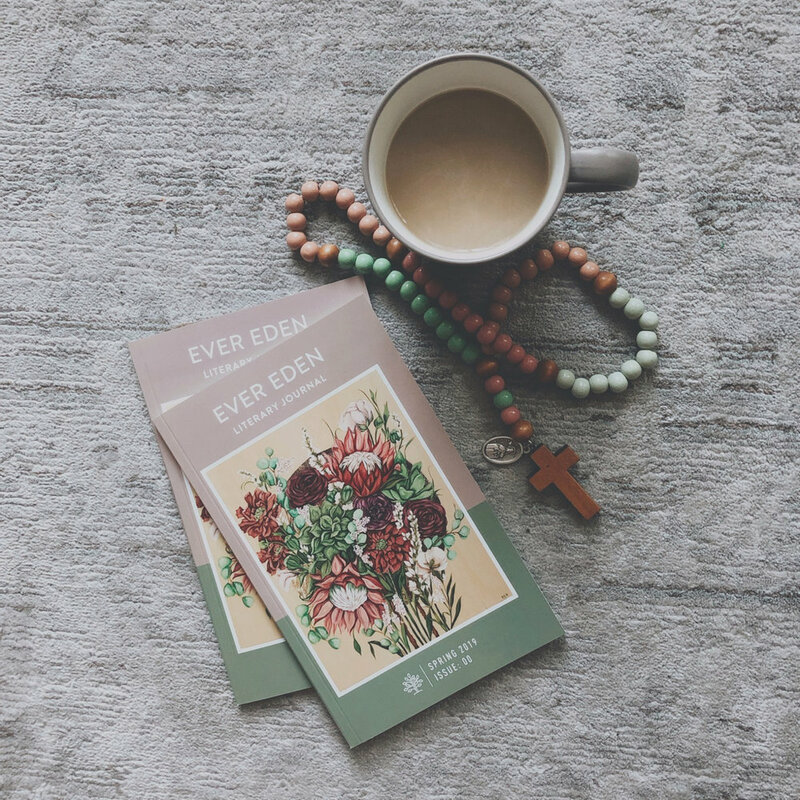 Our literary journal is written by all Catholic women but meant to be enjoyed by men and women alike. We uphold feminine voices as crucial for the edification of the entire Church, not just for other women. We collaborated with some of the best designers to create our journal artfully. We worked directly with a high quality printer so the beauty spills from the words to all corners of the page. We sort through submitted pieces from Catholic creative writers to find the gems. We work with designers and printers to make sure its beautiful in word and form. With the click of a button you input your information to sign up to receive our publication quarterly. This is when you can kick up your feet and relax. Each quarter we print a new issue of creative content that moves you. We send it directly to you. We pride ourselves in shipping high-quality print issues. Sit back, get back to your relaxing, and enjoy every page, poem, and story. Be sure to share with us your favorites on social media or via the contact form. Download a preview of our first issue today! ARE YOU A CATHOLIC SMALL BUSINESS? Copyright © Ever Eden Publishing Company. All rights reserved.